For those of us lucky enough never to have experienced war, the concept is impossible to imagine; the First World War in particular stuns us into incomprehension with the scale of its carnage and sacrifice. But a new book by a local author brings a more personal angle to the tragedy by concentrating on fifteen men whose lives were ended by that conflict. The fifteen stories are all quite different, but the men are not only linked by the fact that they all died in the Great War – they also all played rugby for one London club, Rosslyn Park RFC. Author Stephen Cooper, who grew up in Barnt Green and whose own grandfather survived the Somme, now coaches youngsters at that same club, and when he discovered the list of its war dead, he was moved to find out more about them. Cooper’s extensive research allowed him to piece together not only the lives of the men themselves, but information on their families and backgrounds. Some were from distinguished military families; others, like Guy du Maurier (uncle of Daphne), had a more bohemian upbringing, and some pre-war occupations included wine merchant, perfumier and poet. They weren’t all “apple-blossom youths” – the eldest was 49 – and they lost their lives in various theatres of war, from Gallipoli to the Irish Easter Rising to home turf (a member of the home defence squadron who was killed over Lincolnshire). One of the fifteen was in the first British plane to be shot down by enemy fire, and the group also includes tank fighters, a naval officer and even a balloonist. The author’s turn of phrase alternates between the poetic and the wry (appropriately enough for a book dealing with the tragedies, triumphs and absurdities of war), but the most captivating segments are the diary entries and letters home, stiff-upper-lipped rather than sentimental, giving the men themselves a voice and emphasising the true sadness of lives so brutally cut short. 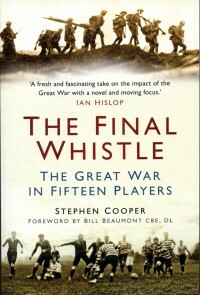 The Final Whistle is published by The History Press and available from bookshops (£14.99) or Amazon (£10.99), or from the library. The author will receive no royalties, donating all monies to the Rosslyn Park Injury Trust Fund and Prostate Cancer UK.